Starring Jorge Diaz (Jane the Virgin) as Marcelo, aka “Chelo,” High & Mighty is a comedy series in Sundance’s new Indie Episodic category. Chelo has ended his penance for a DUI with the removal of his ankle bracelet. He’s seeking a job with some interview guidance courtesy of his girlfriend, Angie (Shakira Barrera), who loves him dearly and essentially provides for him in every way. Having heretofore resorted to blood and sperm donation and prescription-drug focus groups for little money, he wants to make her proud … except that now that he can imbibe again, well, he’s back with his boys in party mode. This Indie Episodic series takes form in 10–15-minute episodes of shorts. Though it is longer (eight episodes), Sundance 2018 showcases the first three episodes of High & Mighty. As mentioned, Angie helps Chelo with his job-interview skills, and the authorities remove his ankle bracelet that tracks his blood alcohol level. Chelo feels little gravitas toward either situation despite Angie’s imploration that he get his act together and his consequent desire to please her. Upon underperforming in a job interview where it comes out that he has little work experience, he connects with his homie, Pat (Adam Zastrow)—a white stoner who hangs with Chicano friends, ever the substance-abuse devil on Chelo’s shoulder—who calls him about his birthday party at the bar. The two meet up with Hugo (J.R. Villareal), a former gang banger turned religious cholo who’s more or less cleaned up. Despite Chelo’s newfound sipping strategy to drinking, he inevitably goes on a bender. The trio ends up in a parking lot smoking weed, when a mysterious van pulls up. The man who jumps out inexplicably fills Chelo with lead with a machine gun. 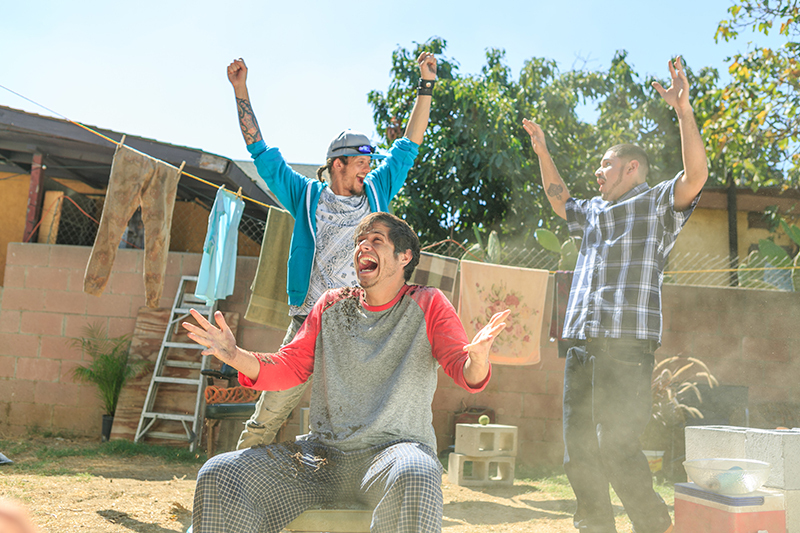 “Turnt” firmly establishes High & Mighty’s identity as a kind of Chicano, stoner-humor amalgam of It’s Always Sunny in Philadelphia and Workaholics with a serial dash of Breaking Bad. 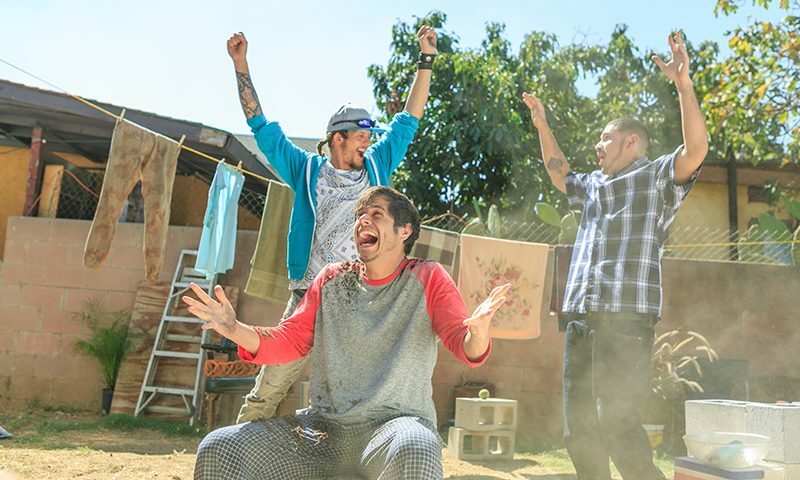 On one hand, it may play up some stereotypes of Chicano suburbia, but on the other, it’s a lighthearted means to explore those tropes in a fun way that feels blue-collar and accessible. The setting notwithstanding, Chelo feels a bit like a caricature at first—always joking and with nary self-control with regard to getting fucked up. Hugo, however, balances the friend dynamic as the angel on Chelo’s shoulder, which suggests that there is a deeper path ahead. Because of this and acknowledging his impaired state, Chelo grapples with what he’s promised Angie. Chelo gets up from the shooting that should have killed him, having peed himself. He freaks Pat and Hugo out by still being alive. In disrepair, he heads to his family’s home, where his mother has forbidden him, for a clean pair of pants. They surprise his little sister, Luz (Chelsea Rendon). The four muse over how Chelo could have survived the shooting—carried out with a real gun and real bullets—walking away with mere bruises and welts. They deduce that Chelo can’t feel pain and has become invincible (for the time being). His three counterparts test out what would normally be injurious and lethal acts on him gleefully. Chelo decides that he’ll make money by starting a YouTube channel, while Hugo opines that it’s a divine act of God, which Chelo should use for good. It doesn’t last, as Chelo suffers an injury shortly after. In “Super, Mang,” we witness Chelo’s façade open up a little via the confliction he feels with regard to his sobriety, apropos of not being allowed at his mom’s and sister’s house drunk. The cause of his subsequent injury demonstrates that he’s actually a well-meaning person, which adds some dimension to the series’ tone. The invincibility-discovery scene is definitely a romping, almost slapstick laugh, while the more serious elements counterbalance High & Mighty’s har-har beginnings. In an ambulance, Chelo, Hugo and Pat ponder why Chelo’s powers disappeared. Once in the hospital, the doctor who checks Chelo out performs a questionable examination. Chelo finds that he looks uncannily familiar. Once Angie picks him up from the hospital, she sobs about how the ordeal scared her, which underscores why she’s happy that he’s turning his life around. After some nightmares and some self-medication to take the edge off, Chelo finds that his conditional powers may be at odds with his endeavor to live up to Angie’s hopes for him. “Shanks for Nothin’” is a good capstone for this triptych of High & Mighty episodes, as its reveal invokes a binge-watch impulse for the next episode(s). The first three episodes hint at the potential cause of Chelo’s powers, and the development of Chelo’s relationships with Angie and his friends helps the intrigue for further watching. Chelo is a mildly annoying character at first, which is not to write off Diaz’s charisma and energy in this role. As these three episodes roll out, Diaz complexifies Chelo with waves of emotion that bubble to the character’s surface, one conditioned by a kind of working-class shell offset by waywardness. Jan. 24 // 6:00 p.m. // Park Ave. Screened with Mr Inbetween (Australia), directed by Nash Edgerton.